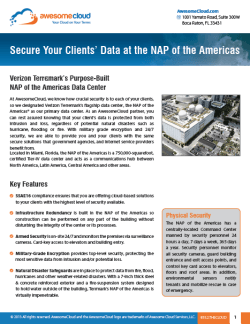 At AwesomeCloud Services, we know how crucial security is to each of your clients, so we’ve designated Verizon Terremark’s flagship data center, the NAP of the Americas®, as our primary data center. As an AwesomeCloud partner, you can rest assured knowing that your clients’ data is protected from both intrusion and loss, regardless of potential natural disasters such as hurricane, flooding or fire. With military grade encryption and 24/7 security, we are able to provide you and your clients with the same secure solutions that government agencies, and Internet service providers benefit from. 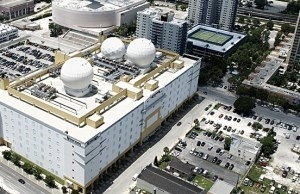 Located in Miami, Florida, the NAP of the Americas is a 750,000-square-foot, certified Tier-IV data center, and it acts as a communications hub between North America, Latin America, Central America and other areas. SSAE16 Compliance (the successor to SAS 70) ensures that you are offering cloud-based solutions to your clients with the highest level of security available. Infrastructure Redundancy is built into the NAP of the Americas, so construction can be performed on any part of the building without disturbing the integrity of the center or its processes. Armed Security is on-site 24/7, and personnel monitor the premises via surveillance cameras. Card-key access to elevators and building entry. Military-Grade Encryption provides top-level security, protecting the most sensitive data from intrusion and/or potential loss. Natural Disaster Safeguards are in place to protect data from fire, flood, hurricanes and other weather-related disasters. The NAP of the Americas was built 32 feet above sea level in 2001 to withstand a Category 5 hurricane. With a 7-inch-thick steel-and-concrete-reinforced exterior and 19 million pounds of concrete roof ballast, Terrmark’s NAP of the Americas is virtually impenetrable. 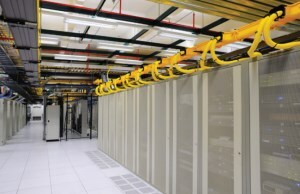 While safety and security is a top priority, connectivity and speed are just as important to your clients, making the NAP of the Americas a fantastic data center. Seven Tier-1 service providers and 160 global carriers provide the NAP of the Americas with upstream access to the Internet. Verizon requires these providers to have at least OC-48 capacity to maintain connectivity to the network. 15 Domestic Fiber Backbones provide superior performance and quickly add any carrier required by downstream clients. Latency Testing ensures that each backbone provider meets client requirements to ensure SLA compliance. The NAP’s electrical and mechanical infrastructure enables you to offer cloud services that are always on and always available. 100% AC Power SLA with 2N+1 redundancy provides you with the peace of mind to offer reliable cloud services to your clients. Power Redundancy with power fed from two independent substations. 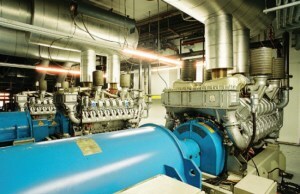 Uninterrupted Power provided by 12 HiTEC Continuous Power Systems. Medium-Voltage Switchgear fed by three independent 13,200 volt feeders. Inspire the confidence of your clients by partnering with AwesomeCloud, and experience the ultimate in security and data protection at Verizon Terremark’s NAP of the Americas data center. As part of the AwesomeCloud Partner Program, your clients will benefit from one the most advanced data centers in the world.